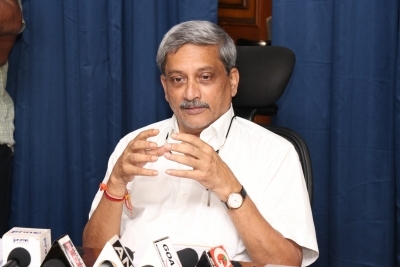 Panaji April 17 (IANS) Accusing central government ministers of running Goa in the absence of Chief Minister Manohar Parrikar the AAP on Tuesday claimed that the BJP-led coalition government in the coastal state was "dysfunctional" and virtually non-existent. "The state ministers are clueless about what is happening. Local ministers have become bystanders and that all dealings are made during the visits by these central ministers whether it is about Goa s land or rivers " Aam Aadmi Party General Secretary Pradeep Padgaonkar told reporters here. Padgaonkar was referring to the vists of Union Minister for Road Transport Highways Shipping Nitin Gadkari and Union Minister for Civil Aviation Suresh Prabhu over the last one month when they discussed state-related issues in presence of local ruling legislators and made several key announcements related to the iron ore mining ban and taxi operator-related issues at Goa s Dabolim International Airport. The Opposition as well as civil society has been claiming that governance and administration has come to a standstill in the absence of the ailing Chief Minister who is currently undergoing advanced treatment for pancreatic cancer at a New York facility. Parrikar who holds over 20 ministerial portfolios has been unable to attend office since February 15. Parrikar had appointed a three-member ministerial committee to take decisions related to day-to-day administrative affairs. The AAP also accused the state government of playing cosy with the influential casino lobby for agreeing to consider a reduction of casino licence fees while at the same time increasing fees for essential services and government licence processes. "The common man is already reeling under steep increase in fees of basic essential services such as obtaining land records in Form 1 and 14 survey plans inspection of survey plans partition and conversion charges. But the government instead of reducing these fees is considering reducing casino licence fees " Padgaonkar added.